New Balance is partnering with Chop Chop magazine to encourage families to “Run the Rainbow/Eat the Rainbow,” or educate readers on the benefits of exercise and healthy eating for the whole family. 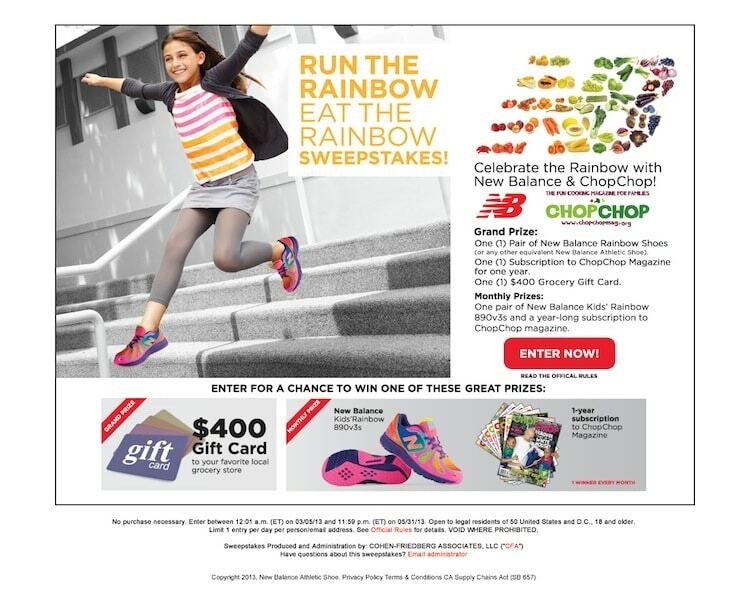 Chop Chop and New Balance is running a sweepstakes in which entrants have a chance to receive a $400 gift card to their favorite local grocery store, as well as monthly prize packs including a 1-year subscription to Chop Chop magazine and a pair Rainbow 890v3s. The Diva Pink with Dazzling Blue & Purple is an amazing color that your child will most love! Remember…be sure to enter here until 11:59PM ET on 5/31/13. 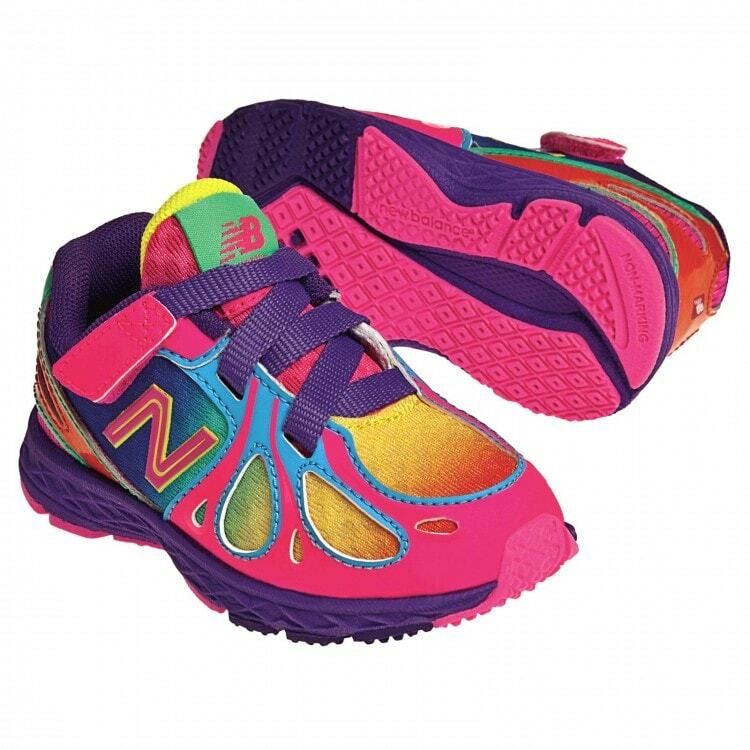 One (1) lucky Lady and the Blog reader will win a pair of New Balance Rainbow 890v3 Kid’s Sneakers! my daughter would love all the colors of these! I love them and they are perfect for little girls who love rainbows, like my daughter. I adore them and I know my 5 year old daughter would, too! Thanks for the chance to win! I think they’re fun and vibrant! My niece would love them! They are so cute, my little girl would love them! I love how colorful they are. I could easily spot my children at the park in these shoes. I think these are rockin’! I know my daughter would go nuts over these! I think these shoes are awesome! Bright and colorful! these are so cute, fun and colorful! 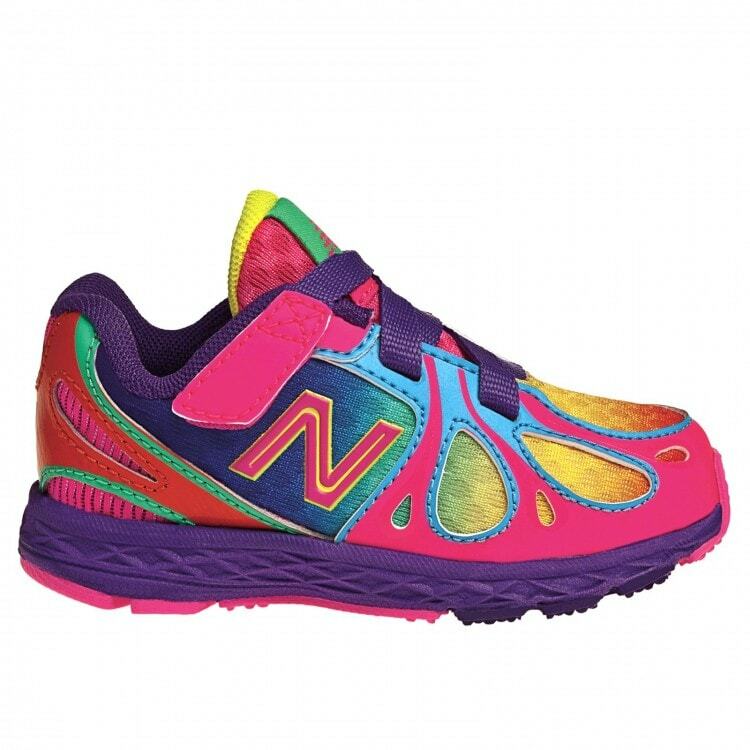 I actually bought my oldest daughter these exact shoes and wished I had more money to buy them for my younger daughter.. they are so bright and awesome! These are so cute! I love love LOVE the bright colors. OMG, I love them! I wish they came in my size. Love the colors and so would my grand daughter! I love the colors they are perfect for a fun spirited little girl like mine. I love them and think my niece will as well. I LOVE LOVE LOVE these! They are so pretty! I love the rainbow colors! My daughter would look cute in them. Oh. My. Goodness. I LOVE THEM. And, actually, they’re really similar to my Asics running shoes. I think, actually I KNOW, my daughter would LOVE them! I think they are great. Love the colors!! Cute and colorful! My daughter would love these. I love them! My daughters will have to have them! Love them–they would fit in w/my Grandaughter’s wardrobe perfectly!!! ((1955nursehjc4me(at)myway(dot)com)) Thanks for the chance…. I love the bright colors, perfect for summer! They would be great for my daughter! My daughter would Love Love Love these!! I love these and I know my grandaughter would too! A little gaudy for my taste, but my daughter would love them! i think they are adorable! my daughter would love them! Love Them! I love the Bright Colors!! My 7 yr old loves rainbow colors so I’m sure she’d like these! I think they are cute. More importantly, my daughter would LOVE LOVE LOVE these! Coolest sneakers ever. I’d buy a pair for myself. My daughter LOVES them. They look so bright and fun to wear. Love these, very bright spring colors. I think they are fun! Any girl would love to have them! These are fantastic! I love unique shoes, and so does my daughter! these are too cute….my daughter would love a pair! I think they are super cute!! very colorful, which would appeal to a child! My daughter would love how colorful they are. I like that they are lightweight, but still look like they would support and protect her foot well. I think they are really cute and look comfy. I blogged about this great giveaway – thank you. my daughter would look adorable in these!!! I love them. Absolutely adorable! my daughter always gets hand me downs, these would be amazing! my daughter would love the bright colors! My granddaughter loves them since there so brightly colored. I think my daughter would like these, I do. they are soo super cute!! love them!!! I think that these runners are the cutest and most colourful I have seen yet. I think they would be fun to wear for older girls too!! I think that they are adorable! I love them! Would love to see them on my granddaughters. They are definitely colorful–look very springlike! I love them. I have honestly ordered these shoes for my daughter twice. Both times they have sent the wrong size and it’s driving me crazy. I love how colorful they are and my daughter likes how New Balance shoes fit. Thank you! I absolutely love the fun, bright colors! My daughter would love to add these to her “collection”. These shoes look great and my daughter would LOVE them!! They look nice, but really very bright! This are different but cute! These are adorable, love the bright colors-perfect for our little ones. These are super precious!! LOVE!!! L’offre Secure Networks? Les solutions Enterasys permettent de sécuriser n’importe quel réseau d’un quelconque fournisseur en détectant intelligemment les menaces de sécurité et en y réagissant automatiquement.Annoncée ce vendrediY figureront des rappels à propos de lutilisation sécurisée des appareils mobiles, artiste.rattachée au ministère de lEconomie, Ces critiques visent les fabricants dordinateurs qui associent leur matériel à Windows de manière trop systématique mais aussi avec des éditeurs de logiciels de sécurité ou de logiciels multimédia. de collaborer et même de bavarder devant la machine à café ait également changé.L’étude menée par Plantronics,ts et disponibilité des services applicatifs virtualisés entra?nent naturellement un intérêt croissant des entreprises pour cette nouvelle fa? En cas de succès de lItanium, lItanium II (version McKinley) sera cadencé à 1 GHz et supportera un cache de niveau 3 de 3 Mo.-Falko-Matte-Fotolia-comons : la pratique pourrait être attaquée comme anti-concurrencielle par différents acteurs existant du marché.